Here are some snazzy birthday facts about 1st of October 1961 that no one tells you about. Don’t wait a minute longer and jump in using the content links below. Average read time of 10 minutes. Enjoy! What day was my birthday Oct 1, 1961? October 1, 1961 was a Sunday and it was the 274th day of the year 1961. It was the 40th Sunday of that year. The next time you can reuse your old 1961 calendar will be in 2023. Both calendars will be exactly the same! This is assuming you are not interested in the dates for Easter and other irregular holidays that are based on a lunisolar calendar. There are 162 days left before your next birthday. You will be 58 years old when that day comes. There have been 21,022 days from the day you were born up to today. If you’ve been sleeping 8 hours daily since birth, then you have slept a total of 7,007 days or 19.19 years. You spent 33% of your life sleeping. Since night and day always follow each other, there were precisely 712 full moons after you were born up to this day. How many of them did you see? The next full moon that you can see will be on May 18 at 21:13:00 GMT – Saturday. Fun stat: Your first one billion seconds (1,000,000,000) happened sometime on June 9, 1993. If a dog named Isadore - a Finnish Lapphund breed, was born on the same date as you then it will be 276 dog years old today. A dog’s first human year is equal to 15 dog years. Dogs age differently depending on breed and size. When you reach the age of 6 Isadore will be 42 dog years old. From that point forward a medium-sized dog like Isadore will age 4.5 dog years for every human year. First session of the French Legislative Assembly. The watch company founded in 1850 in Roxbury by Aaron Lufkin Dennison relocates to Waltham, Massachusetts, to become the Waltham Watch Company, a pioneer in the American system of watch manufacturing. The Pennsylvania Turnpike, often considered the first superhighway in the United States, opens to traffic. Daegu October Incident occurs in Allied occupied Korea. First broadcast of The Tonight Show Starring Johnny Carson. The first brain-scan using x-ray computed tomography (CT or CAT scan) is performed at Atkinson Morley Hospital in Wimbledon, London. Epcot opens at Walt Disney World near Orlando, Florida, United States. The Supreme Court of the United Kingdom takes over the judicial functions of the House of Lords. A ferry collision off the coast of Hong Kong kills 38 people and injures 102 others. Curious about this Green Apple Spiral? This is a party item you can activate and send to your friends when you play the free game Jump Birthday Party. It’s a fun and easy-to-play mobile game for all ages. Get free 1,000 gold coins when you download today! What does my birthday October 1, 1961 mean? Your birthday numbers 10, 1, and 1961 reveal that your Life Path number is 1. It represents initiative, potential and singularity. You are a born leader. You insist on your right to make up your own mind; you demand freedom of thought and action. The following celebrities also have the same life path number: Bennett Miller, Des O'Connor, Peter Hall, Hans Matheson, Sagi Kalev, India Hicks, Eartha Kitt, Chester Bennington, Richard Barthelmess, Stathis Giallelis. 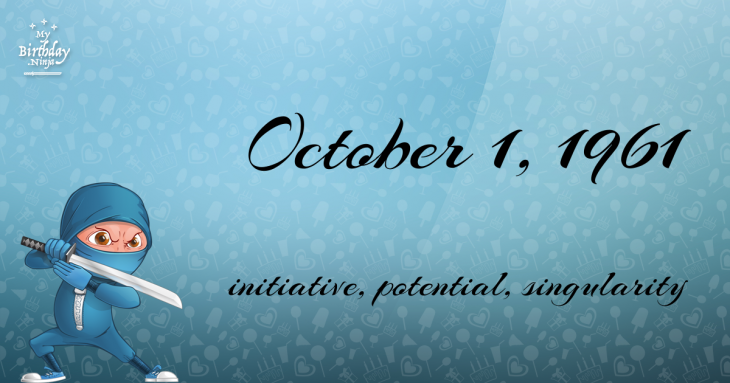 What is the birthday horoscope for Oct 1, 1961? The Western zodiac or sun sign of a person born on October 1 is Libra ♎ (The Scales) – a cardinal sign with Air as Western element. The ruling planet is Venus – the planet of love and beauty. According to the ancient art of Chinese astrology (or Eastern zodiac), Ox is the mythical animal and Metal is the Eastern element of a person born on October 1, 1961. Opal is the modern birthstone for the month of October while Jasper is the mystical birth stone (based on Tibetan origin). The zodiac gemstone for Libra is chrysolite. Lastly, the birthday stone for the day of the week ‘Sunday’ is topaz. Fun fact: The birth flower for 1st October 1961 is Cosmos for constancy. What is the Love Match for Oct 1, 1961? When it comes to love and relationship, you are most compatible with a person born on October 31, 1950. You have a Love Match compatibility score of +157. Imagine being in love with your soul mate. On the negative side, you are most incompatible with a person born on July 22, 1953. Your incompatibility score is -169. You’ll be like a cat and a dog on a love-hate relationship. Arf-arf, I want to bite you. Meow-meow, stay away from me! The number-one hit song in the U.S. at the day of your birth was Take Good Care of My Baby by Bobby Vee as compiled by Billboard Hot 100 (October 2, 1961). Ask your parents if they know this popular song. I do not know how you feel about this, but you were a female ♀ in your last earthly incarnation. You were born somewhere around the territory of Romania approximately on 1875. Your profession was map maker, astrologer, astronomer. How many babies were born on October 1, 1961? Base on the data published by the United Nations Population Division, an estimated 109,557,830 babies were born throughout the world in the year 1961. The estimated number of babies born on 1st October 1961 is 300,158. That’s equivalent to 208 babies every minute. Try to imagine if all of them are crying at the same time. What is the popular baby name on 1 Oct 1961? Here’s a quick list of all the fun birthday facts about October 1, 1961. Celebrities, famous birthdays, historical events, and past life were excluded. 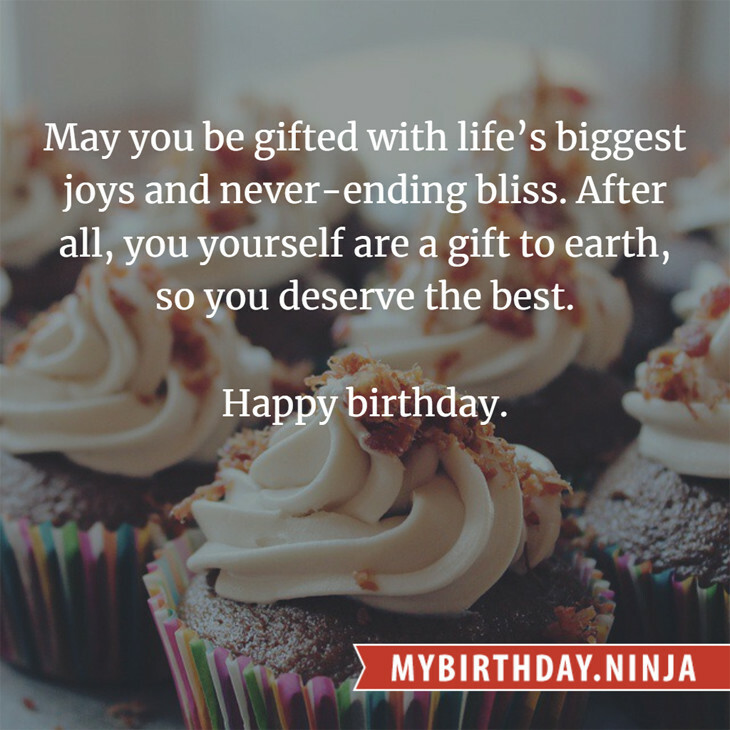 Try another birth date of someone you know or try the birthday of these celebrities: August 15, 1943 – María Rojo, Mexican actress and politician; November 18, 1970 – Peta Wilson, Australian actress; May 28, 1974 – Romain Duris, French actor and singer.